If you have a logic probe, it's enough to see if there is some state change on them, e.g. just after a system reset. On the faulty Chroma I'm working on right now, pin 10 and 15 remain steady to 0 even on power-on. A very quick high-pitched waveform is visible? That'a good news because the DAC and the S & H on DVB is doing something. After that, shows the OSC a very low pitch about 10 - 11 Hz? Then he failed to autotune. The reason for it may be the DVBs are not properly prepared for autotune . Z1 and Z2 should show some "traffic" because they have to refresh the S & H bank. With Z3 and Z4, Z5 I'm not so sure. Once the computer has written data to the DVBs latches there is no need to repeat it. But Z6A (!Oscen) should toggle and Z6b (Atn) should be set during autotune. Keep in mind that there are two different tasks: the computer itself with the DAC etc. and the computer via CMBs logic. the VCOs runs at a very low rate, as per your example (10-11Hz). Z1 and Z2 shows traffic on their outputs, as well as per SHA0, SHA1, SHA2 and the eight SHEN lines. Z3 is mystery, because of Data 3 and Data 5 are stuck to zero, while other Data does work during SetSplit-31. Z6-1 does toggle, while Z6-12 toggles too, and Z6-13 doesn't. Now Chroma boots up properly and does autotune. On a DVB only :-( (and slot 0 doesn't seem to work). I've swapped all boards, even testing one at a time on the CMB, but there are seven failed and one good. Anyway, this is a new starting point for me. One of the DVBs has been eaten by vedrigris, so it had been set aside at the beginning. Other DVBs does have either a good waveform, or a 10-15Hz signal, and one exhibits a <10% duty cycle. Good news, seems the computer is now able to "listen" to the DVBs. One fault was Z6 because it switches the DVBs output to the ZCD via 4016 analog switches. So lets talk about Z3. First the computer loads data to Z3 which it wants to write to a DVB by selecting !WRSYND. Because there is no addressbus connected to the CMB the next step is to decide where that data should be loaded to. This is done by writing data to Z4 A and Z5 by selecting !WRSYNA. The decoders Z10 - Z13 now contains a destination for data. When !WRSYNA goes high a one shot build around Z4 B is fired goes low for about 1.2uSec thus enableing the decoders output. When the one shot has finished the decoders output goes to high and with that positive edge loads data from Z3 into the selected latch on DVD. There are 32 strobes or destinatins so the computer has to repeat it 32 times. What you will see after that on Z3 outputs is data from the last writing. That also is true for Z5 and Z4 A but its the last address. "On a DVB only :-("
does this mean on ONE digital voice board only? sorry, wanna be clear. what is vedrigris? corrosion? 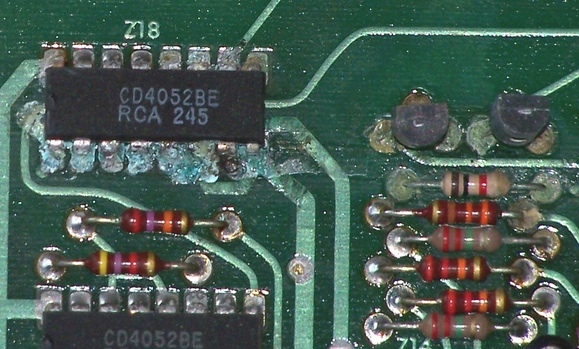 if so, that's pretty wierd, because just last night i was looking around, and noticed that some of the harnesses that the voice boards sit in on the MB were corroded, as well as some of the actual voice boards. one board it was completely shot. let us know your next steps!!!! good news!!! He means "verdigris", which is a copper salt. In the Chroma the only thing I know of that causes this kind of corrosion is a leaky battery. It might be possible to guard against this by taping a bunch of tissue paper around the batteries to soak up the acid in the event of a leak, but I've never tried it, and you'd have to wait years before you found out if it worked or not. The best solution is to eliminate that hideous design of using alkaline batteries and use a lithium one. Or just buy a CPU Plus. Yes, one DVB does autotune, six DVBs doesn't and one is damaged by verdigris (copper oxide). The instrument has been held for years in non-dry environment, but only one DVB has that kind of corrosion. The failing DVBs does sound if SetSplit 31, and I'm checking the Sandro' suggestion about the thermal compensation resistors (they read about 1.93k, but these days here we have more than 30°C). Anyway, those seven DVBs exhibit a quite irregular waveform, with a 20-30% duty cycle at best trimmer settings. The voltages are correct, capacitors on CMB are new and I/O board offset reads 0mV. Now I have to fix the EQ board to relax a bit :), after a real fight against CMB and I/O board. Then it will be DVBs turn. Just to clear what I meant. a little more info on my side: i tried seating just a single VB, and booting, in random slots of the CMB. i rotated VB's as well. same problem regardless. HOWEVER, i did notice something interesting: listening at the main HI audio output, there is a pretty loud digital/logic type of noise constantly there. sounds kinda like SMPTE code; random noise bursts and such. about half the time that i entered set split 31 or 33, this noise went AWAY, and then the one voice seated could be heard. upon boot, the single voice would always be silent(this is the same if i boot with all 8 cards seated). does this help diagnose? could this noise im hearing somehow be causing the autotune function to fail? Most likely, either the noise is on a supply rail, because bypass caps have dried out, or there's a dirty ground connection. It's always best to get the global problems like power supplies and interconnect fixed first, before trying to replace ICs and such. From Wikipedia: "Verdigris is the common name for a green pigment obtained through the application of acetic acid to copper plates or the natural patina formed when copper, brass or bronze is weathered and exposed to air or seawater over a period of time. It is usually a basic copper carbonate, but near the sea will be a basic copper chloride. If acetic acid is present at the time of weathering, it may consist of copper(II) acetate." thanks paul. ive got one of luca's new PSU's in the unit; where else would i possibly have bad bypass caps? the MB? the EQ board? i'll go back and try to ensure all my grounding is solid as well. There are bypass caps all over the place. Anything connected between a supply rail and ground is a bypass cap, and if it's aluminum electrolytic, it's suspect after 30 years. in the Chroma restoration I'm carrying out, I've found that audio signal at EQ O/P is only with positive half-wave, therefore I decided to replace the four 4558 on EQ board. I've got some MC33078 dual opamps, low-noise with high slew rate, but I found that they autooscillate. Should I increase those 10pF capacitors on feedback? Or, upon your experience, is it better to choose a different chip? Which ones self-oscillate? If you're talking about the ones that have 10p feedback caps, you could certainly try raising those to 47p, without risking rolling off the audio. I would be most suspicious of the power amps in Z6. If they're oscillating, tacking a small cap from op-amp output to input might quiet them down, but best would be to drive the minus input via a small resistor from the circuit output and a small cap from the op-amp output, breaking at something like 100KHz, like 1K and 1.5n. But it may also be possible to find an op-amp that simply doesn't self-oscillate, because it has more phase margin. I've never used the MC33078, but the NE5532 is known for its insensitivity to capacitive loading. You might also check to make sure that C1 and C2 aren't dried out, thus increasing the high frequency impedance of the power supplies. many thanks for suggestions: I'll investigate and I'll post the results. A hint: there are lots of tech tips and explanations in these days; it would be nice to collect them in a dedicated troubleshooting section of the website. Are all outputs 0 -3 only positive halfewave? You can check it with parameter 5. First look with a scope to CMBs Z18 and Z19 outputs. So if there's anything o.k. its the EQ. The EQ has two seperate grounds one coming from CMB via J25-4 and J25-5 the other called output ground from rear panel via J19-7. Check that connections. A CEM3360 output is a bipolar current source. Its output impedance is idealy infinite but in reality it's some MegOhms. There is a thumbrule: For low impedance sources take a bipolar opamp, for high impedance sources a Fet opamp. So try a TL072 or better or as I did a OPA2134. From NE5532 I know that they like to see a blocking cap about 0.1uF or so from pin 8 to 4 Replace C1 and C2 as Mr. DeRocco told you. I was actually going to bypass the entire EQ circuit after I got the pressure sensor kit installed. Z18 on CMB was gone (+11V on pin 7) and replaced. I've mounted 100nF polyester caps across pins 4 and 8 on the four dual-amps on EQ board, and replaced both C1 and C2, but they still self-oscillate. I've just ordered some TL072 to see if there is some criticity on MC33078. Now the EQ input looks okay, but I can't see any signal on the input OAs; I'll check further when new OAs will arrive. I agree, and it's a great idea. I have made a very small step in this direction by including a list of troubleshooting threads on the 2010 archive index page. But I may start a page that is more comprehensive, and organizes the information according to theme (voice boards, I/O board, etc.) as well as pointing to relevant sections of Martin's Hardware Fault Diagnosis & Repair, the Service Manual, etc. Remember also that for now there is the Google site search on the home page. what you think about to create a troubleshooting wiki section, e.g. with MediaWiki package, so that users could fill in their experiences and hints? It should save lot of work in arranging the various emails. If your hosting cannot allow it, I can freely host it for you and you can simply link it from your website. I'm sorry Heinz, this is not the case: the CEM3360 output is essentially the same of an OTA amplifier; so the output is a current proportional to the control current and the input voltage; the output impedance thus vary from very high to very low. In the Chroma the designers correctly chose to connect the CEM3360 outputs directly to a virtual ground node. A virtual ground node is the inverting input of an operational amplifier with a feedback resistor from its output to this point. Such configuration is also known as a summing amplifier with a near 0 input impedance; the output voltage is a function of the current injected in the virtual ground point times the value of the feedback resistor; this configuration is used in the Chroma in the CMB to sum all the signal currents from all the channel boards and in the EQ board, following the CEM3360 acting as volume controls. In this application the input impedance of a bipolar op-amp is perfectly adequate (given the low feedback resistor); also a lower noise and distortion is preferred (NE5532); further more the EQ board feed the 4 independent output jacks and here you need op-amps with high output drive capabilities. 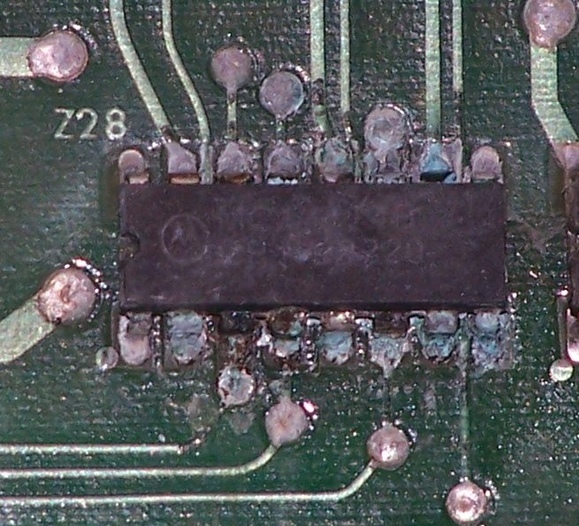 Again the NE5532 is capable of large voltages on a 600 ohm load; the 100 ohm output resistors are ok for this kind of op-amps; others would self oscillating in presence of long cables for example. I'm sorry that Luca has already ordered the TL072; the designers of the Chroma knew what they did; before replacing parts you must be sure of what you are doing, otherwise troubles can be expected. In this specific case you will end up with more noise, more distortion, less output headroom and instability; the 4558 is much more similar to the 5532 (a poor man 5532 if you like). I'm sorry that Luca has already ordered the TL072; the designers of the Chroma knew what they did; before replacing parts you must be sure of what you are doing, otherwise troubles can be expected. In this specific case you will end up with more noise, more distortion, less output headroom and instability; the 4558 is much more similar to the 5532 (a poor man 5532 if you like). I would say a 4558 is a pretty crappy alternative to the 5532, even though they're both bipolar. The latter was for a long time the preferred op-amp in pro mixing consoles and other audio gear. That said, an 072 isn't bad; it might have a tad more white noise, but having bought them there's no harm in putting them in and seeing how they do. Especially if one first puts sockets on the board. Anyway, NE5532 were already ordered too. The customer asked to use OPA2134: do you think there are some compatibility issues? I know, but I didn' want to go to deep in an OTAs theory. In pratice those current sources are build around two complemantary current mirrors. The datsheet says the CEM3360s output impedance is from 5 (min.) to 12 (typ.) Meg Ohms at +/- 100uA. The inverting summing amp was choosen because you don't have to deal with the mirrors compliance. They are always tied to (virtual) ground. But you may be right about BIPs and FETs. In my case I use OPA2134 FETs without any problems. Sold for USD$999.99. I've added a few more pictures to the registry entry. the big blue capacitor is known being the most prone to failure; sometimes its filtering feature is highly degraded, so that the +5V contains very high ripple. Although you can simply replace the cap, please keep in mind that all PSU components have the same age, and 30 years run is a very long time for them. I suggest to install a new SPSU kit (I know, I made them, but I cannot see any reason to repair a very old and possibly stressed PSU). Item #220632379208, ends July 11, USD$125.00. Description says only, "Rhodes Chroma voice card dated 1982. It is untested and sold as-is." 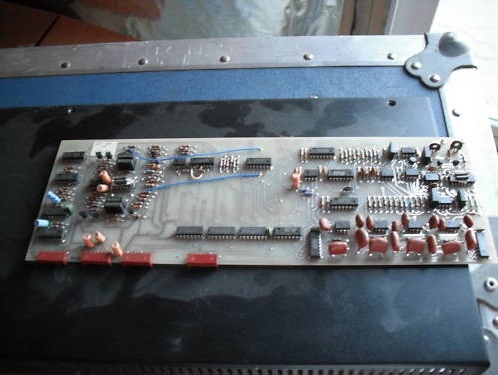 From the colour, looks to be an ARP board. what you think about to create a troubleshooting wiki section, e.g. with MediaWiki package, so that users could fill in their experiences and hints? It should save lot of work in arranging the various emails. I've been considering a wiki for a couple of years, but haven't got around to it thinking about it seriously until now. Setting it up is pretty straightforward. The question is, what will its relationship be to the "main" site? I can see a range of options, from strictly troubleshooting information, to pretty much encompassing the entire site. There is, perhaps obviously, a bit of a feeling of "losing control" on my part. But my motivation has always been simply to provide a great support site for the instruments (original Chroma and Polaris). Would it make sense for people to be able to edit, say, the Keyboard Magazine Review? Perhaps some pages/articles could migrate from the wiki to the site, or vice versa. In terms of editors, I'm tempted to start out, at least, with a pretty select group—essentially, anyone on the mailing list and/or familiar to all. Any and all thoughts and advice appreciated. I think the main site is really very good: if you extended the main site with a wiki section (sort of like what Symbolic Sound does on their internal wiki - it requires a membership and id/logon and is *not* accessible to the public) - then I think that's fine. If the public gets write-access to it then it might get hacked, spammed, or irrelevant content linked into it. Read access is fine. But, as I said, the main site is already a good site and it may be simply useful for users interested in user based content (experiences etc...) that they submit directly to you in some controlled format/way/method (ex. a zip file of the html and images etc...) - that could be done without having any wiki and you would simply post the content with edits/formatting as you have always done. Just a quick note – I didn't have much problem installing the CPS kit. One question is – how do you know it's really generating the full range? What I did was hook up MIDI to the Chroma (I have the CC+ board), went into programming mode (Set Split 36), and enabled transmission of pressure (Set Split 26). Then I could hook up MIDI-Ox and watch the values to know that I have the sensor adjusted to the correct height for all keys. Maybe David or Sandro can chime in to say whether the most current public version of the CC+ code supports Set Split 26 or not. I did follow Chris' and Luca's instructions and used a spacer to raise up the supports for the damper bar since the original felt was 1/4" thick and the new pressure sensor bar is 3/8" thick. That gave me room to adjust the sensor bar properly for pressure. The sensor conditioning circuitry provides 0-4.8V to the Chroma ADC. I test the sensor array operation using audio. I have not looked at MIDI data. My damper bar was originally set at the lowest position and now just a bit up with the sensor installed. Makes sense. I'm seeing MIDI data from 01 through about 7D if I press really hard, which is excellent. Since it is not sending the full 5v, 7D is probably the top end value. Excellent job to you Chris for creating the kit and to David and Sandro for the CC+ and the support for the pressure option. If you sit back for a second, it's pretty amazing that a machine made just before MIDI realy hit can now be used as a decent master controller, including sending out poly pressure. All in all, this is simply an amazing machine with an amazing support team. The support for transmission of Polyphonic Key Pressure via MIDI has been implemented in CC+ firmware 213. The sending/not sending of MIDI pressure messages are controlled by the Configuration Mode P26 selection. [Set Split 36] + P26 will allow the user to choose "On" or "Off". If set to 'On', pressure commands will be sent via MIDI (if they are generated from an installed pressure sensor). If set to 'Off', pressure commands will not be sent via MIDI (regardless of whether a pressure sensor is installed). Pressure values transmitted have values from 1 to 127. Polyphonic Key Pressure transmission is supported. Channel Pressure messages are not supported. Please see The Chroma CPU Plus (CC+): Firmware. Due to the ever-increasing complexity of U.S. Export regulations, McMaster-Carr has decided to only accept orders from a few, long-established customers of ours overseas. We cannot accept your order, and regret any inconvenience this causes you. Your order has been cancelled. Well.. those hardware can't be found in Europe, and only some of them could be purchased but at a price like gold. Any improving choice change would be welcomed; I've chosen Allen head screws because of their duration in respect with standard Phillips ones. I've also tried to buy them via Amazon, but still impossible export, don't know why. No hurry about shipping, therefore I guess standard USPS would be fine. Please answer on this mailing list and not directly to my mail, to avoid overlaps. Payment with PayPal is the preferred one. Stepping out from behind my virtual hedgerow of California Lurker Shrubs to extend a hand... I may not be a master Chroma tech, but helping procure SAE hardware is certainly within my abilities. Please mail me directly to confirm/ nail down details, etc. thanks for your answer. Then I need your street address, where I can ship the goods. Then you should send them via USPS (Priority Mail International Small Flat Rate Box, US$13.45) to my address in Italy; please let me know any further expense should you encounter in this (e.g. transport to USPS, coffee etc.). Please send to [email address removed] your street address and the PayPal address I can use for payment. I've already asked the supplier for total shipping weight, to be sure it does fit in the above shipping category (4 pounds). I'm facing a problem with a terrific damaged Chroma; most of the failures have already been fixed, and now I'm on the dual voice boards (ouch!). There are two DVB apparently okay: replaced Z19, Z20 and Z25 as per recommendations, the thermal compensation has been corrected as per Sandro's good suggestion, the waveforms on test points are sharp square, good waveforms over all the sound path until to output summing, the ZCD regularly triggers those waves, but still autotune fails. By setting SetSplit31 and randomly playing on keys, both boards send a correct output when compared with a working DVB on same set. By monitoring the CV S&H followers (Z21 to Z24) output I didn't find any issue. Another couple of DVBs are (now) okay and the instrument correctly autotunes them, when inserted in same slots. Machine has CC+ (213) and SPSU. You should also test the filters. Perhaps the autotune is failing to tune the filter rather than the oscillators. I'll have a look on that. When I was working on my DVBs I have some failed 4052 muxes too. That boards where also "killed" by the computer. Item #120593828299, starting bid €10,00, no bids yet, ends July 16. 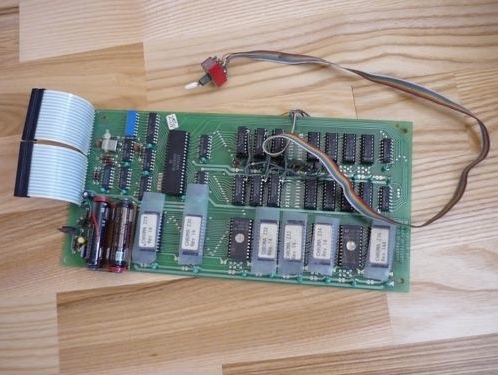 From the description: "Rhodes Chroma CPU board with a modification to support two banks of 50 patches. The switching is done by means of a mechanical switch. The board worked just fine when I remove it from my Chroma two years ago. It has not been powered on since then." This is from Chroma 21030450, which has been upgraded with a CC+. My Chroma was in storage for a few years and was working perfectly. After a few starts everything came back on and is working. However, I am encountering a weird problem. With some, and only some presets when they are pressed a rat-tat-tat drum sound is heard from the center area of the Chroma-not through the audio out- just an audible drum sound. Can anyone help solve this problem? Probably the panel tapper. Does it only occur when you have a switched parameter like one of the Mod Selects selected, as opposed to a variable parameter like one of the Mod Depths? If so, it could be a flakey power supply making it appear that the parameter slider is moving around, and changing the parameter erratically. I agree with Paul about the power supply. Just to know: by pressing [SET SPLIT] (blinks) followed by  you can toggle the tapper action on or off. I've been using an elektron machinedrum to control and sequence my chroma and having a lot of fun, but there's something amiss with pchange. Basically the machinedrum can send any value but the chroma only responds up to 50, so I was wondering if the cc+ could take higher values and coorelate them to the 4 banks for greater control and flexibility? Michel - as it happens, using Programs greater than 50 to access the other banks is what's done today. Specifically - if you send Program 51, then Bank 1 is selected. If you send Program 52, then Bank 2 is selected, and so on. Thanks for the responses. The toggle switch did the trick; no more gremlins. It does take several starts and reboots after warming up to fully turn this one on. There's also a bit of a buzz from the power supply. So would you agree that these issues mean the power supply has to be replaced? Either replaced or fixed. Replacing it with Luca's modern design is probably the cleanest solution. I put the new PS and the CC+ into the Chroma, Actually my friend Ed did. Now I need to start loading the patches from the new eproms 4 banks. Anyone know how to get this working? I cant find the instructions for after you install the hardware on the site. the error 01234567 means that none of the dual voice cards is autotuning. First of all, double check all ground connections after SPSU installation: if a ground wire isn't properly connected as written in the SPSU pages, you can have a board totally not working. If ALL green wires are connected, together with the black one coming from the SPSU PCB, it could be an adjustment issue. Connect a DVM to ground and the heatsink on the new SPSU PCB and adjust the screw trimmer on the SPSU board (not the switching PSU!) to read exactly 5.05V. Then connect the DVM, max sensitivity, to TP1 and TP2 on I/O board, press [SET SPLIT] and adjust the only one trimmer on I/O board to read the minimum value (hopefully 0mV). Now you have the instrument with correct voltages to adjust dual voice boards. Here the procedure could be carried out either with a scope ot by ear. If you've got a scope, press [SET SPLIT], connect it to each dual voice board Test Point in turn and adjust the closest trimmer to see an equal 50% duty cycle waveshape. If you don't own a scope, connect a headphone shield to instrument ground and, with the jack tip on a test point, adjust the closest trimmer to get a "hollow" square wave sound; please DON'T PAY ATTENTION to the PITCH while adjusting: the only sound characteristic to observe is the harmonic content. Then perform an autotune and see which board(s) are still failing, if any. as answered to other post, I guess there is a wiring mistake somewhere and/or an adjustment issue. Anyway, you asked how to load patches from new eproms 4 banks: I don't understand now, because this has nothing to do with CC+ reset. To load patches you need a working instrument, and your Chroma now needs some more attention. The bank switch syntax is to hold down [Prog Select] and either , ,  or  respectively. To reset the CC+ press [SET SPLIT] followed by , as per original instructions. Referring to CC+ User Manual, please have a look to the CC+ dip switches to enable/disable the startup delay if needed. Rob - Luca's recent replies are quite complete and should hopefully help address the main issues (the lack of tuning, and failing of the boards). To answer your question about 'reset' of the CC+ - there really isn't one, as one shouldn't be required. A new CC+ board comes pre-loaded with 4 banks of patches, and these should be present as soon as the board becomes active. As no batteries are needed, these patches should remain in the CC+ unless they're overwritten or manually erased. If they've all been erased, they can be relocated as you normally would a set of patches - by tape, MIDI SYSEX or by entering them by hand. The main issue though likely is that since all the boards are failing auto-tune (and/or auto-tune is not running), the boards are all being excluded from being used (hence it may seem like no patches are present, because no sound is produced). ed has tested all the voltages and the are correct, the dip switches, the wiring, grounds are exactly as instructed and still no go. He took the mother board out and it was bad with rust and decay so he rebuilt all the connections etc, still not right, some functions such as midi out seem to be good. is there a possibility I have a defective cc+ board? Maybe running them at 3 volts erased the programs..? If so, could i ship it back to you for testing to make sure its ok.? I still have the old eprom board to try out which he will do probably tomorrow. Allthough my Chroma stays best in tune I have a little problem. After it's getting very warm in Europe one voice is slightly detuned but caputered by Autotune. By checking with Set Split 26 and 27 I can hear a little frequency modulation on A oscillator. It's somewhat fast and randomly i.e. not running "round". I use programm 40 bank 1 detune set to zero. A leaking 4051 Dmux in sample & hold circiut? Any suggestions? maybe a leaking S&H capacitor; do you think the S&H update frequency could match the modulation you hear? All S&H caps are new ones. Yes, I fear it's the S&amo;H update frequency that causes that FM. Before it's getting warm everything works fine. Temperature rises up to 45 Deg. Celsius in the Chroma. So I believe a semiconductor will do that. Or a via killed when changing the caps? First I will change the S&H 4051 Dmuxes.